An elegant woven sweater for sublime style. 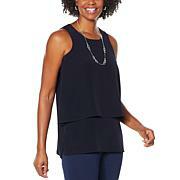 This beautiful tank interjects the mundane midweek for an option that's perfectly transitional and versatile. Really like the light material of this tank. 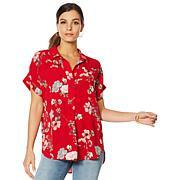 Just perfect to wear all through the summer and into fall. The color blocking really adds to the look. I ordered the matching duster and get lots of compliments. Looks very high end fashion. I think I will order another color. This is a true to size piece. It comes with a tank attached which is great since it is sheer. I got the black with the matching topper piece. Gorgeous and very expensive looking. I'm 5'2" 135lbs, got it in S.
This does run small and I returned it and sized up. I only kept it because it makes a set with the matching sweater. Itll be cool during hot weather. The tank is longer than shell. Its nice, but not wonderful.